This post is sponsored by Real California Milk but the content and opinions expressed here are my own. I love my dairy. But, in a world of alternatives, and mass selection, so many of my favorite dairy products come in so many options. A cheese loving gal can really feel a bit overwhelmed browsing the cold case at her local grocer! And, with so many brands, dairy products, flavors, and varieties, it can be tough to know which dairy products should make it in the cart. For me, the answer is simple- I look for the products with the Real California Milk Seal. As someone raised in, and currently a resident of, California I not only look for the seal to ensure my dairy foods are coming from a sustainable and local source, but take pride in knowing that 99% of California dairies are family owned. You can spot the seal on many of your favorite dairy products from cottage cheese and cream cheese to liquid milk, drinkable yogurt, ice cream, and so much more. Check out the Real California Milk Seal locator here, or visit some of my preferred local retailers such as Sprouts, Smart & Final, or Vons. 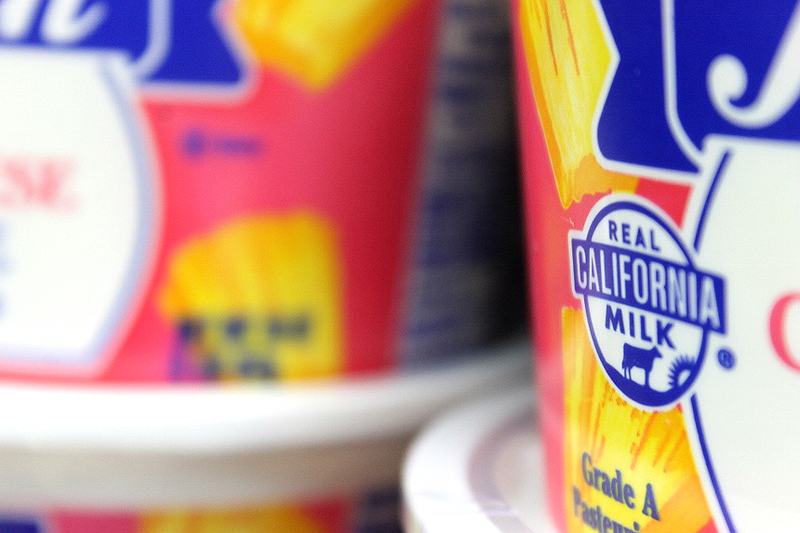 When you spot the seal on a product you know you can take pride in your selection knowing California dairy is a healthy source of protein, and California milk is a healthy, tasty, way to get essential vitamins and minerals. If, like me, you truly love having quality dairy products as a part of your daily diet, but simply don't know what ingredient to start with, or how to find the time to incorporate it into your day- then look no further than this post. I'm about to share with you several delicious, simple, ways to incorporate several types of dairy into your everyday healthy snacking routine. 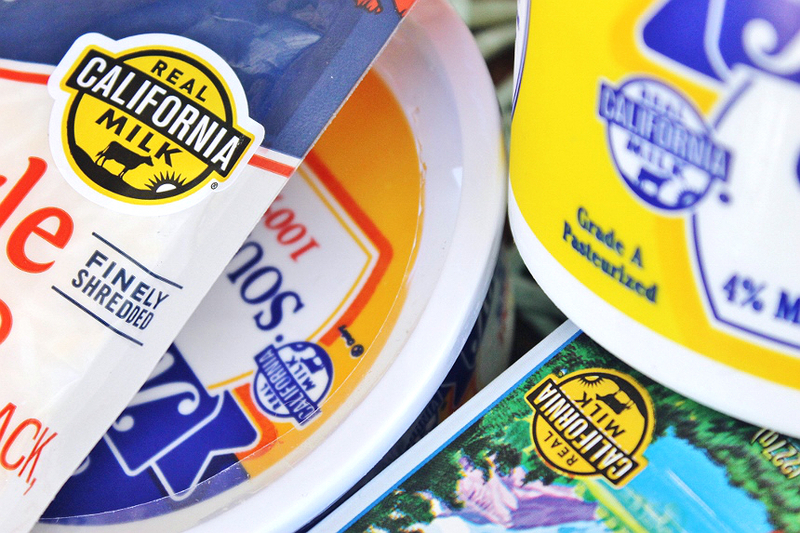 Once you've loaded your cart with some of the very best products featuring the Real California Milk Seal, you truly can't go wrong. 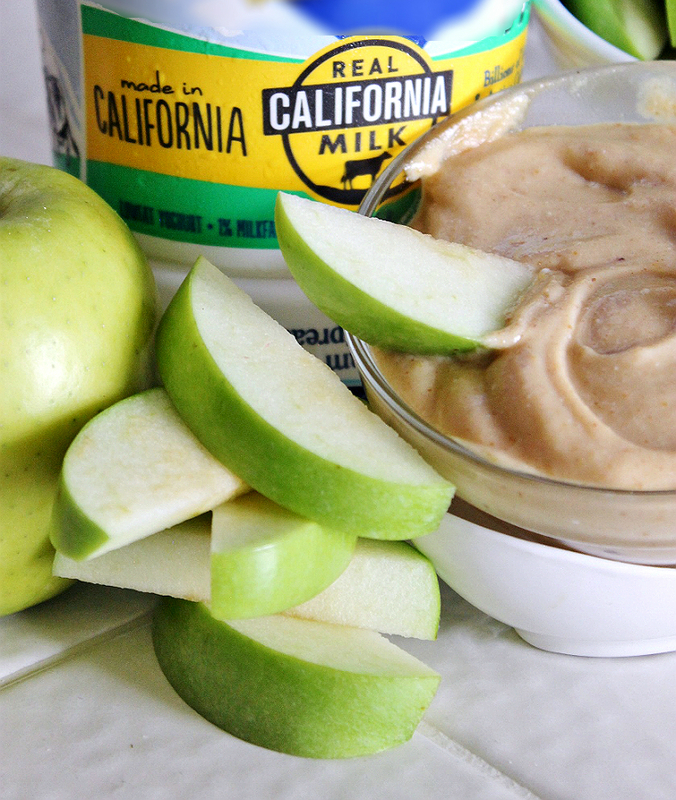 Let's start with a simple 3 ingredient Peanut Butter Apple Dip- You know what they say about an apple a day, so why not pair it with some delicious Greek Yogurt featuring the Real California Milk Seal? This dip is fluffy, creamy, and the perfect balance of tangy and sweet to curb those afternoon hunger pangs. 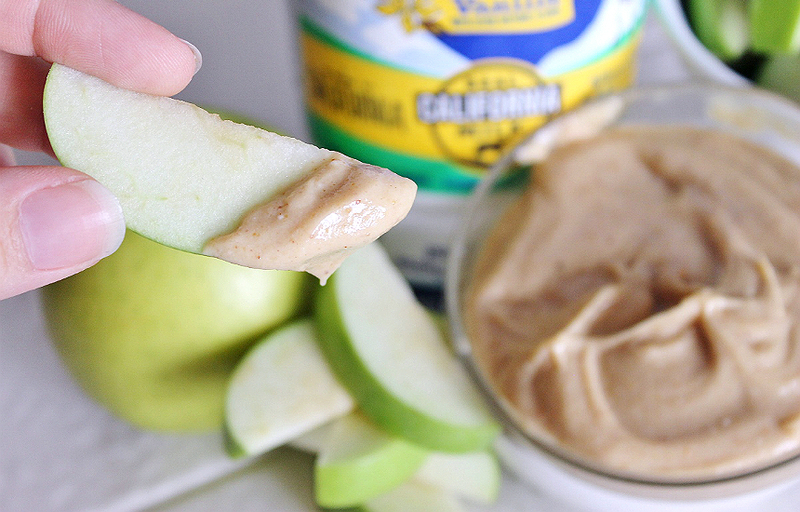 Best of all you can make a single serving, or make an entire jar ahead of time, so snack time is always a breeze. 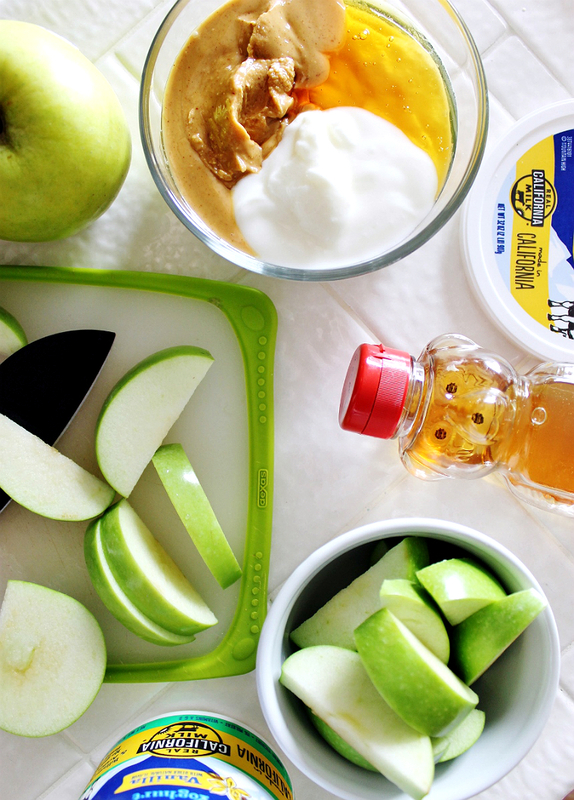 Dip some fresh cut apple slices, or any other fruit your heart desires! Combine all well in a small bowl with a spoon. Recipe may be made in larger quantity and stored in a well sealed container, in the fridge, for up to 1 week. 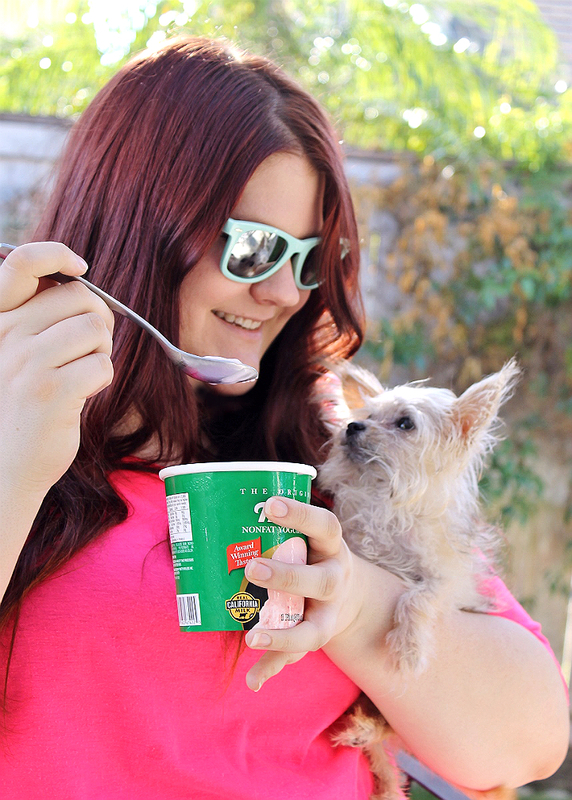 While you have your yogurt out why not prepare a snack you can enjoy direct from the freezer at any time. Frozen yogurt may be so 2017, but we're shaking things up with an entirely different kind of frozen yogurt- the literal kind. 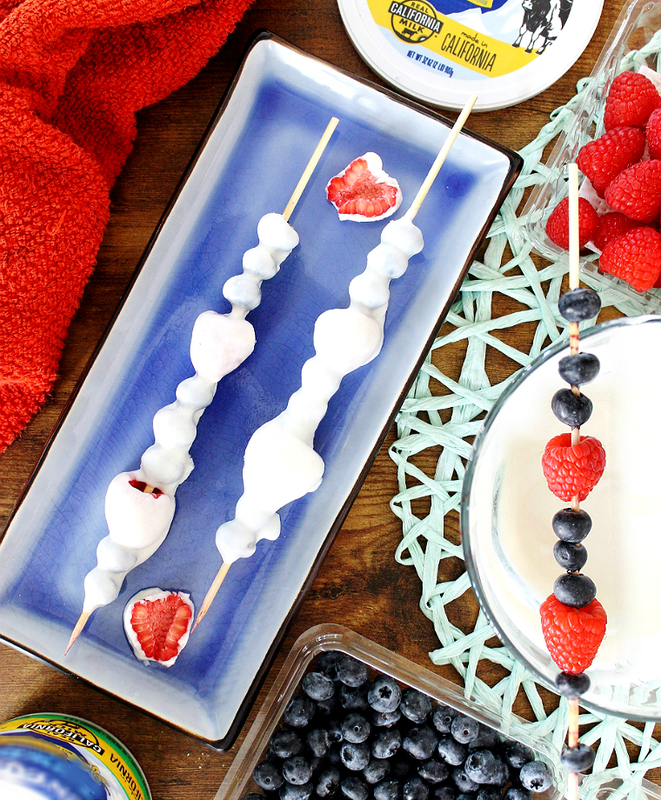 Did you know you can slather your favorite thick yogurt over fresh skewered fruit and with just an hour in the freezer have instant fro-yo berry bliss? While the East Coast may be busting out the chunky sweaters and PSLs we're still living it up Summer style here in SoCal. In fact, Southern California is known for it's seemingly never-ending Summer season, and that means temperatures are often still in the 90s this time of the year (especially inland.) 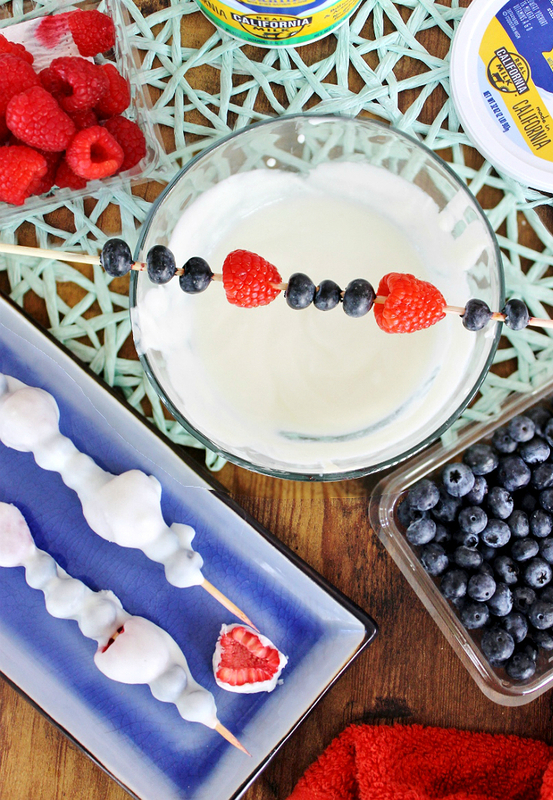 But we don't let the October heat rain on our parade, we chill out in style with simple snacking solutions just like these Frozen Yogurt Berries. After all, isn't everything better on a stick? Of course the Fall and Winter holidays will in fact come, whether the complimentary weather does or does not. That means plenty of parties, potlucks, and home entertaining. 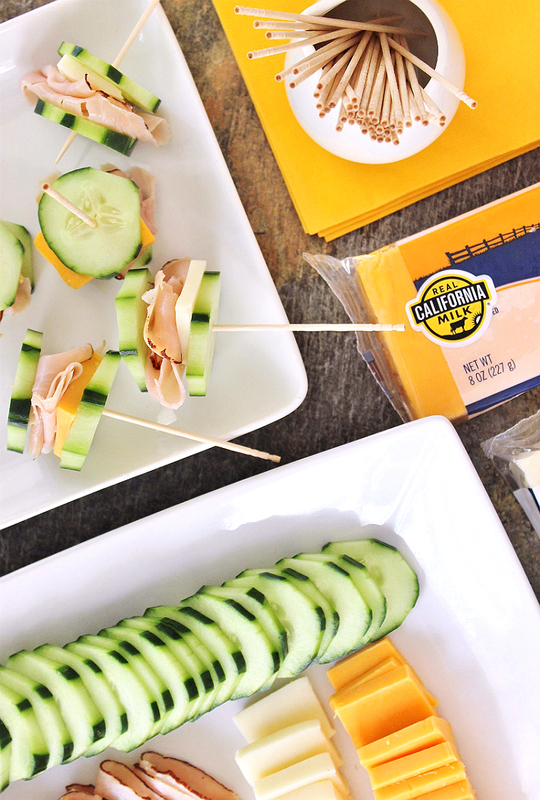 Help keep a hungry crowd snacking happy with this simple Cucumber Sandwich finger food spread featuring your favorite Real California Milk Seal cheese varieties. 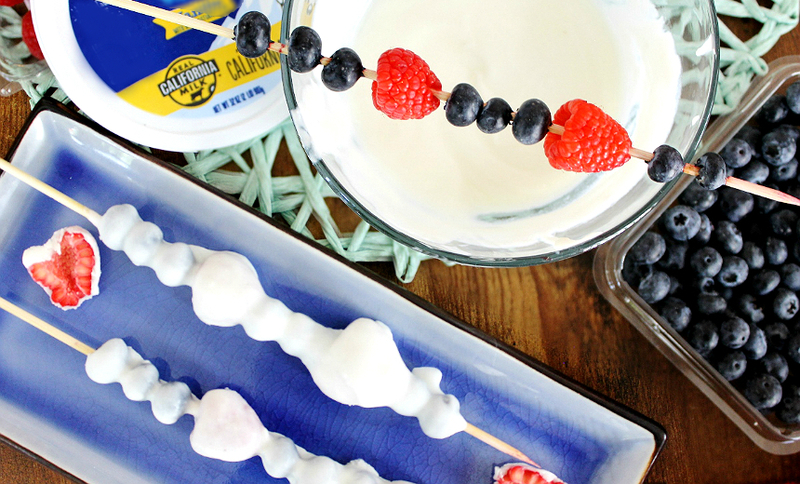 This one's pretty self explanatory, and our family's favorite way to enjoy some dairy while watching a big game. Using a potato peeler alternate peeling vertical lines along the edge of your cucumber, then cut it horizontally into 1/4" slices. 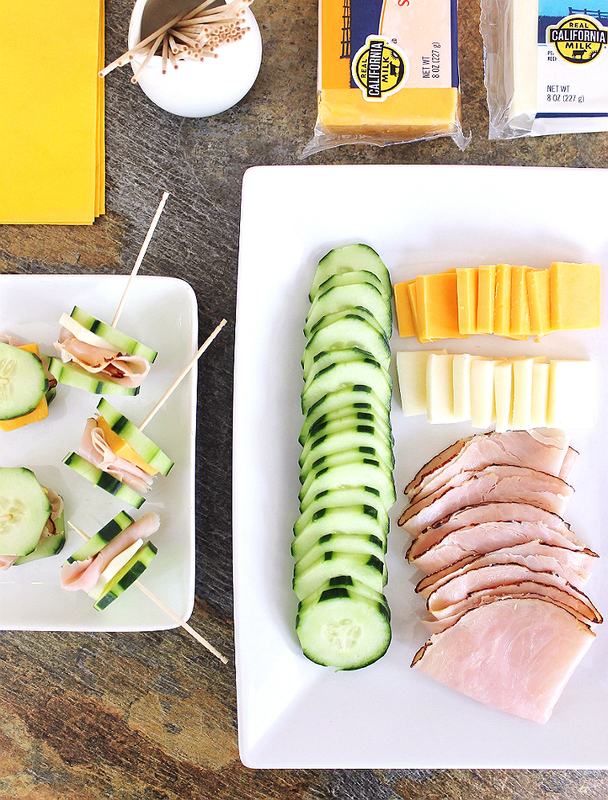 Add your favorite deli cuts, cheese squares, and even baby tomatoes if so inspired. There simply is no way to do a meat, cheese, and veggie plate wrong when you have great cheese in the house. 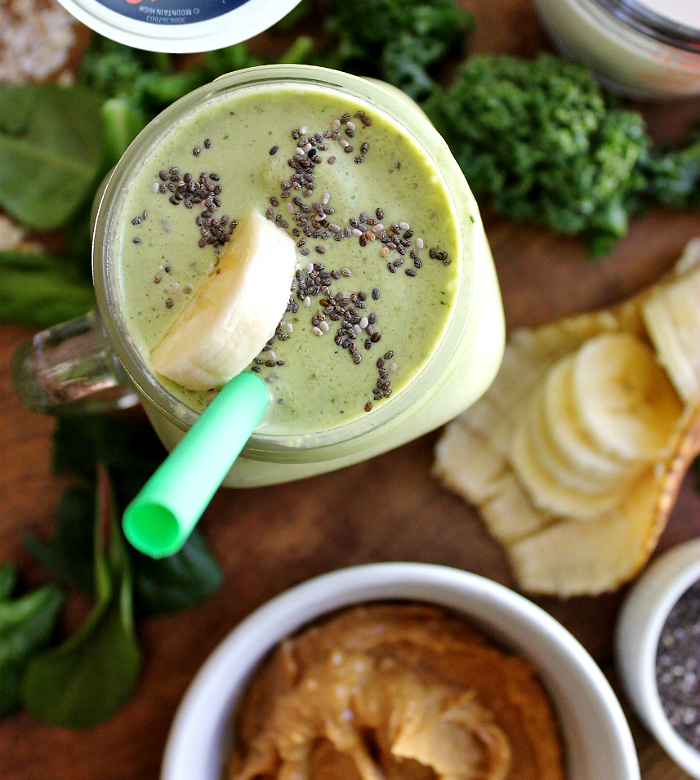 If you're the sort of snacker that prefers to get your protein and nutrients while sipping on the go, then a delicious, green, smoothie is perfect for you. Our favorite PBK Smoothie is full of rich textures and flavors that trick your mind into thinking it's enjoying a shake or dessert, rather than energy packed snack time solution. Add all items in a blender and blend on pulse until well combined. Garnish with banana medallions and a sprinkle of chia seeds. 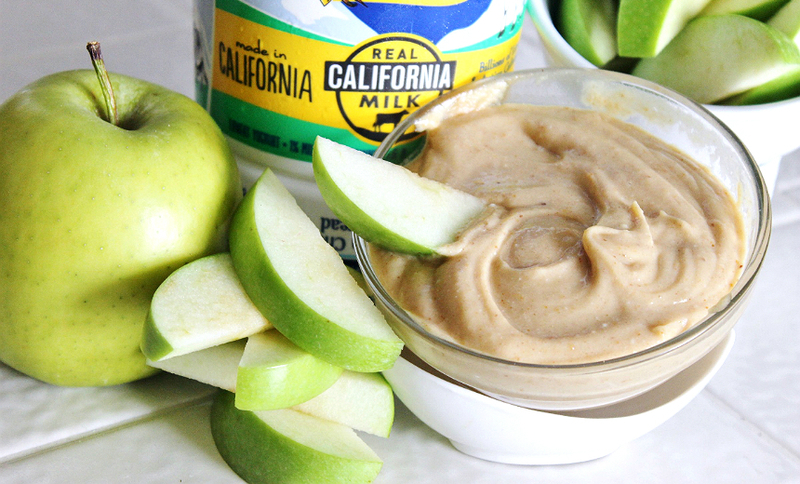 And, for those with little ones at home, or simply true kids at heart, my final simple and healthy snack offering features more seasonal Fall apples, and one of my favorite types of dairy, cream cheese. 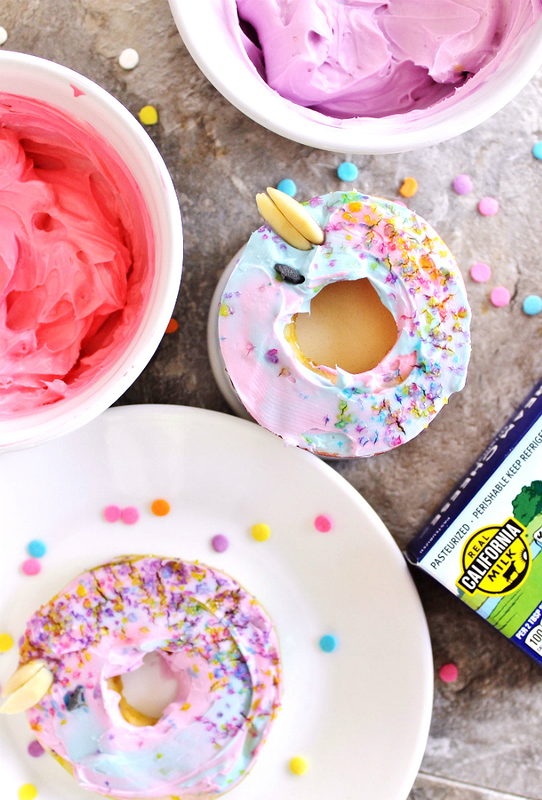 You'll fool even the pickiest of eaters on first glance with these gorgeous slices apple rings and their 'faux' cream cheese frosting. Simply portion your cream cheese into 3 bowls and add a drop or two of food coloring to each. I find pink/red, blue, and purple blend beautifully to make some magical unicorn like hues. While you can find many flavors of cream cheese featuring the Real California Milk Seal, I rather enjoy original cream cheese. Of course a drop of organic vanilla extract will add an extra touchy of delicious whimsy too. 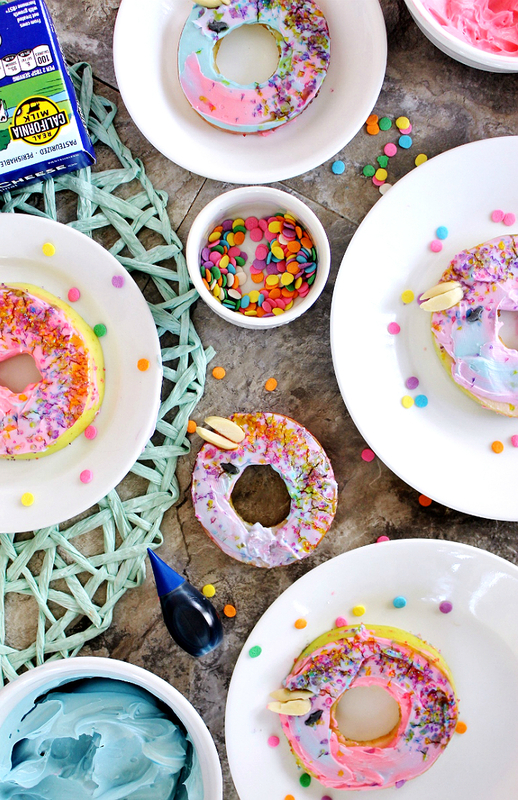 Since I decided to decorate my faux donuts with sanding sugar in a variety of rainbow hues I did not add any other sugar or flavoring to my cream cheese or apple slices. 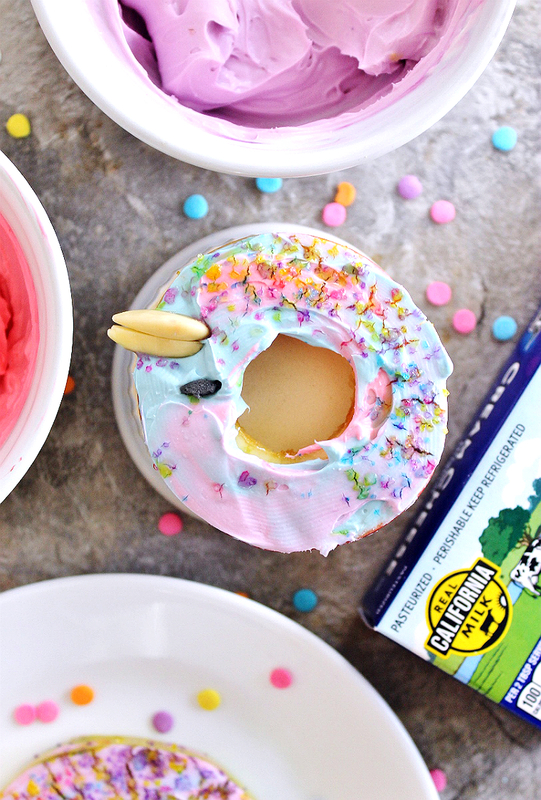 My horns were made of slivered almonds, and the eyelashes were actually shark shaped confetti sprinkles- but you really can get as creative as you want with these. While these can be prepared ahead an refrigerated to serve later in the day, sanding sugar, as opposed to sprinkles, will tend to bleed, and make the spread crack a little over time. As a result these look best when prepared and eaten immediately. If you are struggling to get the cream cheese to adhere to your apple slices be sure to pat the slices with a dry paper towel prior to spreading for a nice clean, dry, surface. Jay is pretty vocal that apples are not his preferred fruit, but even he wolfed several of these Unicorn Apple Donuts down without prompt. Apple donuts, in general a fun idea any time of the year- consider trying these with a touch of pumpkin spice sprinkled atop! And, thanks to the many types of apples, you can enjoy your simple snack as naturally sweet, or sour, as you like it. Of course, sometimes you don't need any preparation at all to enjoy your favorite dairy foods as a snack. 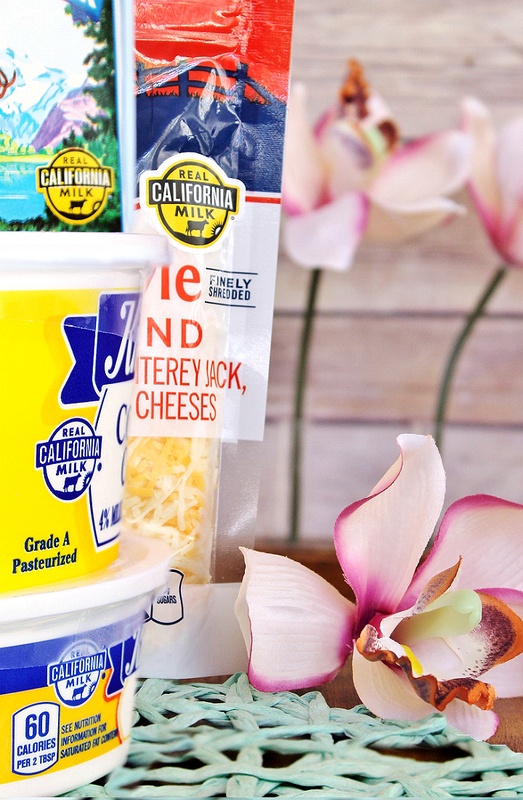 There are many ways to enjoy snacking with delicious dairy bearing the Real California Milk Seal, but the first step is to check the store locator and find some products near you. 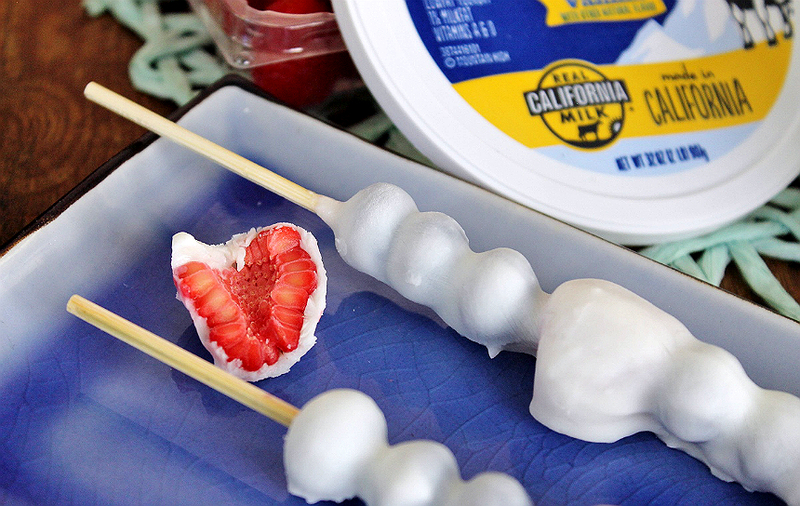 You just might be surprised that some of your favorite ways to enjoy dairy already feature the Real California Milk Seal. Now, tell me, what is your favorite healthy snacking option?